Pulitzer Hotel and salon boat on the canal. 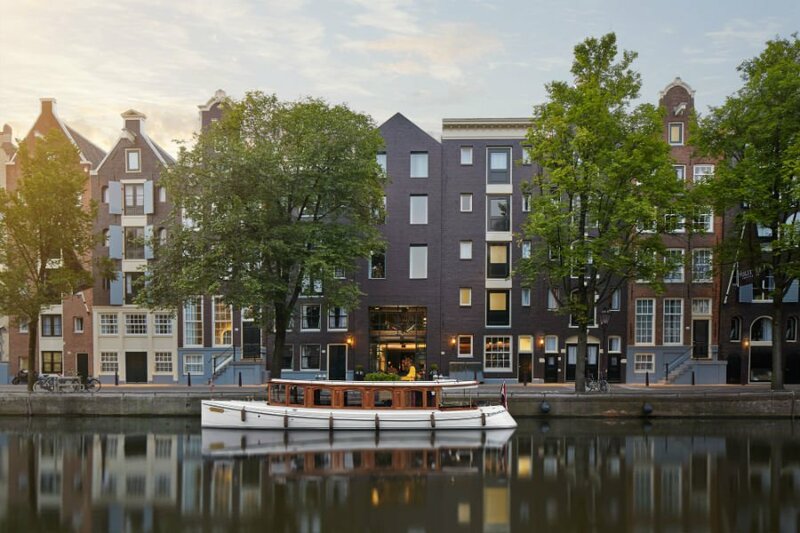 A whopping 25 canal houses and courtyards come together in one iconically Dutch hotel. Fathom co-founder Jeralyn Gerba checks in to check out an old Amsterdam property with a new look. 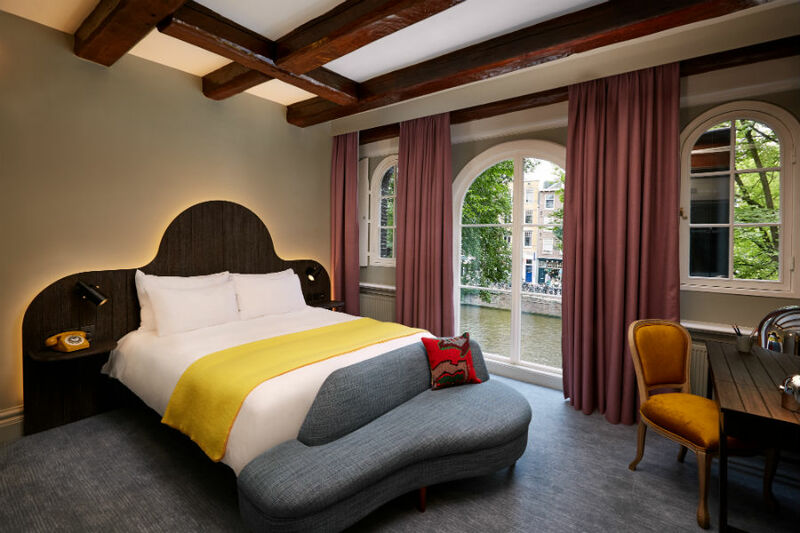 When I stayed at the extensively resigned Pulitzer Amsterdam, it had everything I was hoping I'd find in the city: Dutch house charm, Netherlander design mojo, incredible canal views, perfect neighborhood location, a chic aesthetic that doesn't take itself too seriously, and access to a captained boat (you know, when in Amsterdam). Twenty five town houses (amassed over time by the grandson of Pulitzer Prize founder Joseph Pulitzer) were joined together in the '60s to create the city's first five-star hotel. 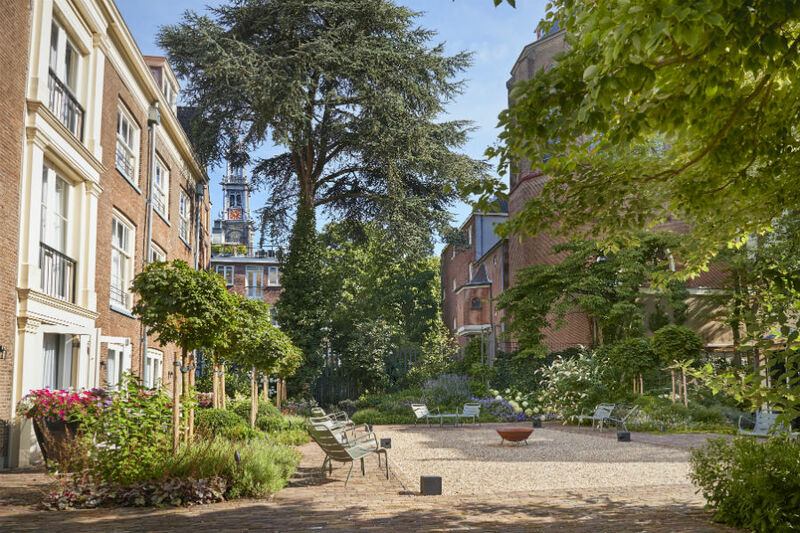 A massive refurbishment helmed by creative director (and Tom Dixon protégé) Jacu Strauss and Dutch garden architects Copijn in 2015-16 resulted in a fun and fabulous series of suites, gathering spaces, and manicured outdoor spaces that are elegant and playful. 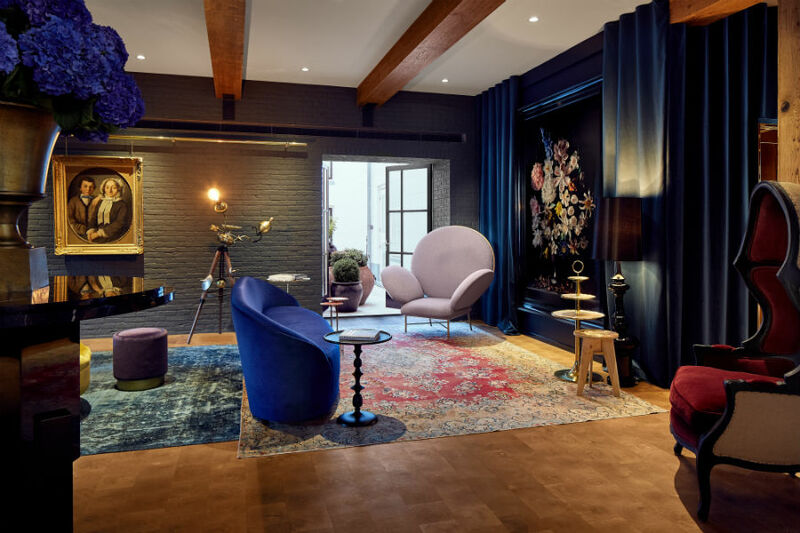 The lobby — eccentric, spacious, industrial – is filled with Persian rugs, upholstered furniture, and a collection of classic and contemporary Dutch artwork. There's a flower stand, a nook of Pulitzer Prize winning books and, just beyond the concierge desk, a cafe in brass and green velvet with a glass wall that overlooks an outdoor courtyard. It's clear that the redesign focused on making the hotel feel like a resource for the community. On the weekend I was there, it felt like there were more locals than out-of-towners. The glam address includes a sumptuous bar (excellent lighting, more brass and velvet) and beautiful restaurant for adult socializing. But my travel companion was a toddler and had little use for expertly crafted cocktails by candle light. Nevertheless, the hotel proved to be a great place to parent for a few reasons: Watching boat traffic from our bedroom window served as late-night entertainment for my jetlagged babe. The tiny fried meatballs (bitterballen) from the cafe proved to be a perfect kid-size snack. 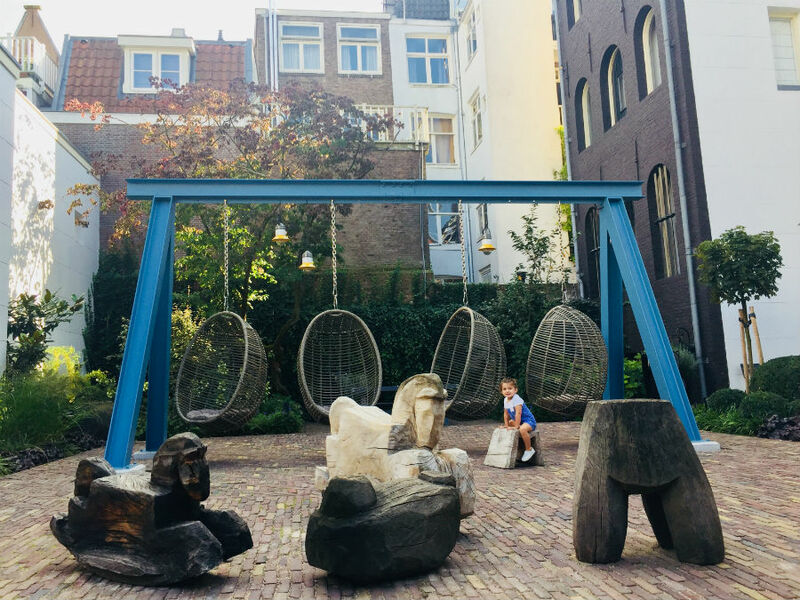 Then there was the discovery of a lovely interior courtyard with cocoon swings and large wooden rocking horses. A truly hidden gem. My girl was over the moon. So was I. Rates start at $255 per night. Make a reservation at Pulitzer Amsterdam. 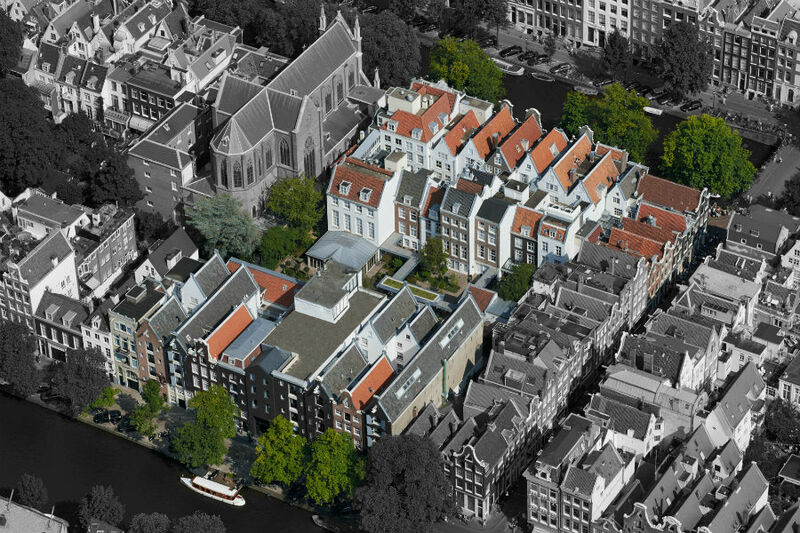 Two rows of back-to-back canal houses overlook central canals Keizersgracht and Prinsengracht. Intelligent design with a grin. The quirkiness feels very Dutch and very authentic. First-timers to the city — it makes a great impression. Families with kids who would be happy on a rocking horse. A big garden courtyard for lounging in the sun. Lots of nooks for meetings or book reading/people-watching. There are a dozen well-appointed meeting rooms that would work well for private events and weddings with an edge. The hotel has a relationship with a local church where they can organize events for up to 1,000 people. 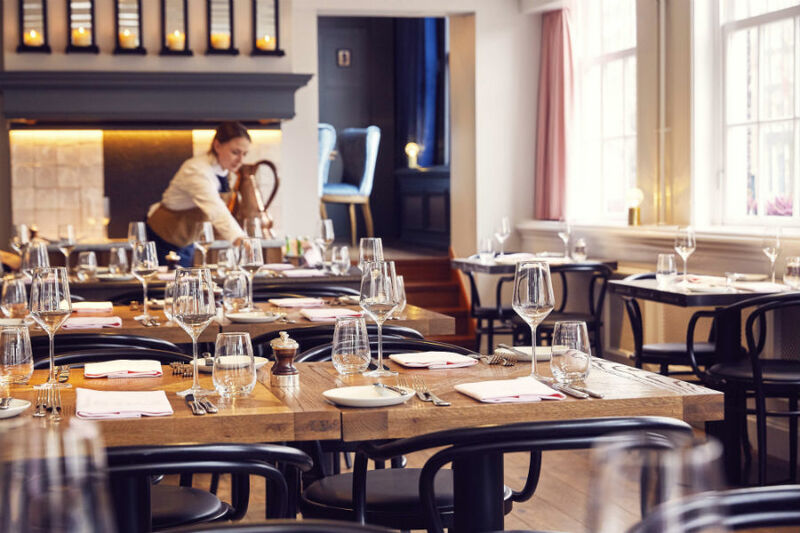 Jansz offers upscale, all-day dining in a tall bistro setting streaked with sunlight and hung with pink drapes. 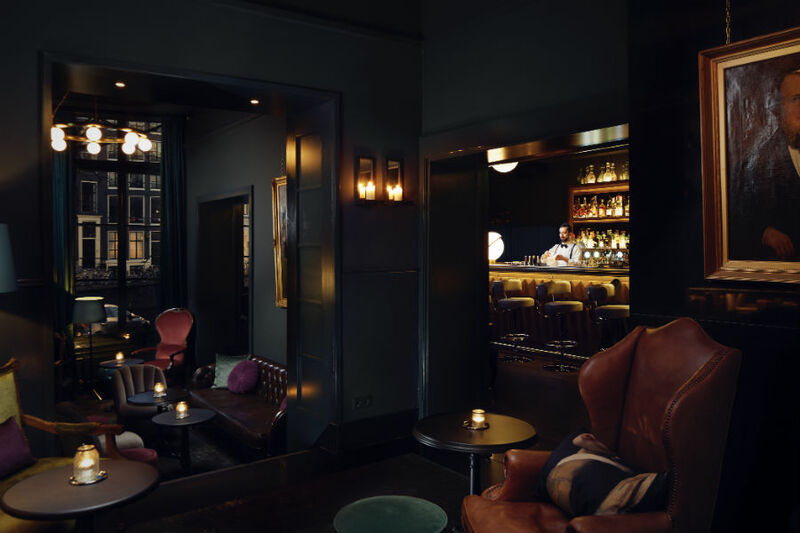 Pulitzer's Bar is dark, moody, and rife with romance and potent drinks. Indoor-outdoor cafe Pause is laid-back and very pretty. It's a nice place to take in the paper with a coffee, or catch up with friends among creeping ivy in the courtyard. There's an elegant private dining room for parties of ten. There are 225 rooms and four suites inspired by the elaborate lives of the characters who used to live in the houses (art devotee, book junkie, music composer, antique collector). In true Dutch style, there's a bicycle repair kit in every room. There are extremely comfortable beds, snacks, Le Labo toiletries, a vintage phone, free WiFi, a mini fridge, a safe, and videos on demand. For turndown service, a plate of traditional stroopwafels do one better than chocolates on the pillow. Bikes and boat rides are extra but would make nice complimentary perks. Front desk reception could get a bit hectic during check-out time, though staff and service are lovely around the clock. The Collector's Suites would be a real blast to stay in. 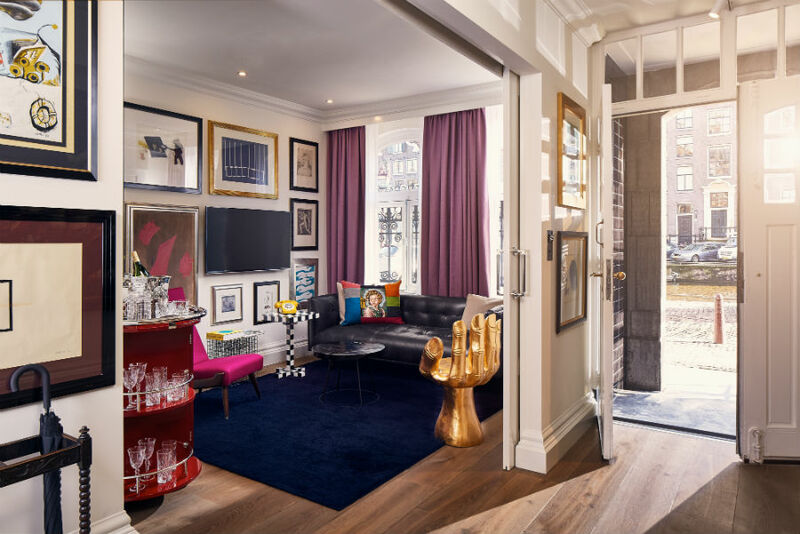 More like swish apartments than hotel rooms, they have their own entrances on the canal and are filled with objects of desire — like pop art and sculpture in the Art Collector's Suite, and shabby chic finds in the Antique Collector's Suite. Drop a pin on the hotel when you're making your way through Amsterdam, even if you're not staying here. There are many excellent design details (like an apothecary-inspired lounge at the restaurant/bar entrance) that are well worth a gander at the very least. The Pulitzer feels like it's in the middle of it all. The historic central canal belt is a UNESCO World Heritage site, with three major canals (Herengracht, Keizersgracht, and Prinsengracht) dividing the area into De Negen Straatjes, or Nine Streets, the indie shopping district filled with Dutch boutiques, cafes, and cobblestone lanes. Rijksmuseum, Stedelijk, and the Van Gogh Museum are nearby. Anne Frank Museum (and its very long line) are just a block away. The adorable Nine Streets, Jordaan, and the flower market are right here. Little kids and their grown-ups will get a kick out of a shop called Mouse Mansion, a little shop filled with handmade miniatures and dioramas that are staged and photographed for a series of children's books.